Vesta’s Solar Rosary is golden magic. It will inspire your heart and fill it with delight, the delight you knew in childhood playing with sunbeams, witnessing your first sunrise, experiencing the Sun’s rays caressing your upturned face. The imagery, the beauty of each visual, the prayers and songs themselves, will uplift and inspire you. This rosary to Vesta, Goddess of the Sun, is filled with images that heal and illumine. Warm your soul in solar light and bring a new radiance of joy to your day. Shine your light with Vesta. Our Sun brings prosperity everywhere. Within its solar rays is life itself. Give this ritual liberally and see the increase in your ability to emanate your true essence. Each time you participate, your aura and entire being are clothed with a greater brilliance, your heart renewed by light’s embrace. Drink in the golden liquid light of the Sun within each prayer and song. 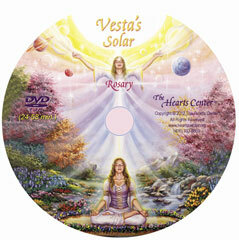 Add the momentum of your love to the collective field being fashioned by all who offer Vesta’s Solar Rosary regularly. It is transforming our world. Vesta, the feminine co-ruler with her beloved Helios are our true Godparents. Vesta is a cosmic, or divine, being who focuses the highest aspect of the Mother Light of love-wisdom for all lifestreams evolving within our solar system. She steps down the supernal feminine light of beloved Omega, who focuses an even higher frequency of God energy within the Great Central Sun. Vesta was the virgin goddess of the hearth, home and family in Roman theology. The sacred fire that burned at her hearth and within the various temples consecrated to her epitomized her presence. Her Greek equivalent is Hestia, who kept the flame at the central hearth on Mount Olympus on behalf of all the gods and goddesses and mankind. This rosary is a devotional ritual that allows you to enter into the spirit of the sun by singing and giving praise to the Source through the one who shines her light of universal love upon all. Just as our sun is at the center of our solar system, so within every cell of our being and at the midpoint of each of our chakras is a sun. During the giving of this rosary, you may breathe in the warmth of Vesta’s Solar radiance and feel it enlivening your being, harmonizing, healing and raising all in purest light. Visualize in your mind’s eye a great sphere of radiant golden energy around your aura, sealing you in an inviolate energy field of illumination and wisdom. Feel the Solar rays cleansing every particle of your being. Know that you are free in God to pursue your divine plan in joy because the Sun of God lives fully within you. As you rise in consciousness you raise all life. And the entire Earth is blessed in the process. Vesta’s Solar Rosary is for initiates of Aquarius—those who are committed to help precipitate a new Solar consciousness in which unity and collaboration replace dualism and competition. The Master Omraam Mikhaël Aïvanhov, who taught for nearly fifty years in France, said that in the New Age Surya Yoga (sun yoga) will supersede all other forms of yoga, for it includes all other yogas within it. Within our Hearts Center Community we use the Solar sciences of the Spirit to attune to our Source through our Solar, or I AM, Presence. We engage in meditation at dawn and safe solar gazing during the first hour after sunrise, when the ultraviolet rays are not harmful to our eyes. Begin with mindfully gazing at the sun with great devotion for only ten seconds, and then add ten seconds per day as you desire until you are able to gaze up to a maximum of about 44 minutes. You may then gradually decrease the time one minute per day until you reach 15 minutes and then maintain this time thereafter. Through this ancient spiritual practice you may experience a quickening of certain higher spiritual faculties and a gradual awakening to your own Buddha nature—your enlightened state of pure Being. Vesta has shared that as more devotees of the sun and initiates of the sacred fire participate in the giving of this Solar Rosary, she will weave a garland of golden-pink celestial light around the Earth that will become increasingly more tangible in coming months and years. And she will place a focus of her love, through divine talismanic magic, at the center of the homes of those who commit to the giving of this rosary with great devotion and presence on a daily basis. We pray that you will enjoy this holy offering from our hearts and join us in giving praise to God with beloved Vesta, our Sun-Mother.